Downtown Denver has become a Mecca for mobile restaurants. Think tricked-out food truck (P. 16 of ColoradoBiz magazine, 08/10 issue). These trucks are selling everything from cupcakes to biscuits and gourmet lunches. The cupcake truck, who was affectionately named Clementine by her Facebook group, sports a large following (including our own resident foodie, Meredith). 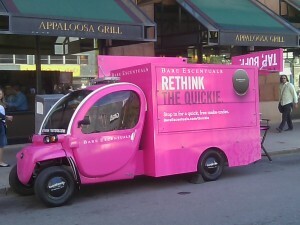 Today I spotted the next era of the tricked-out truck – a van that provides skin care for ladies – and one with some sass! Good-bye appointment, hello service on the lunch hour. And it’s super cute too! It definitely gets one’s attention. It’ll be interesting to see if this new business model is viable in the long-term. It is built around a unique offering brought directly to the customer with a sense of style for differentiation. Time will tell.